Cafe Thirty-A first opened its doors in 1995 and has been consistently serving the best locally sourced regional cuisine ever since. Located in Seagrove Beach on 30A, Cafe Thirty-A offers an upscale atmosphere with delicious food to tourists and locals alike. My fiancée, Chase and I, pulled up to the restaurant and discovered that they offer a valet service. A very nice perk, especially when parking is tough to find these days. After dropping off our keys, we were promptly seated. We started off our night by ordering cocktails. I chose the Lucky Dog Margarita Martini, which consisted of tequila, orange liqueur, sour mix, and fresh squeezed orange juice. It not only tasted refreshing, but gave back to the community too, as it donates $1 to the Alaqua Animal Ahelter each time the drink is purchased. They are in dire need since Hurricane Michael, so drink up! Chase stuck with his usual, a whiskey based drink, and ordered The Thirty-A Old Fashioned. A classic cocktail served in the traditional method and with a single batch bourbon, Chase thought it was fantastic. The cocktails were a pleasant start to what would be a lovely dinner. For appetizers, we heard by word-of-mouth that the quail and grits was one of the best things on the menu, so we definitely had to put an order in for that. We also decided to get the tempura soft shell crab as well. Both appetizers were beautifully presented. The tempura soft shell crab was very lightly fried with sweet and spicy flavors and was accompanied by a zesty Asian sauce. The crab was finished with jalapeños and peaches, two additions that complimented the dish and really brought it all together with the perfect balance of umami. The quail and grits has been a signature appetizer at Cafe Thirty-A for many years, and it was easy to see why! To start with, the grits can be a stand alone dish with their delicious creaminess. There are just no words to give this dish’s flavor justice. I would eat these grits alone for breakfast every single day. The tender grilled Georgia quail with it’s perfect smoky flavor makes this a food critic favorite! For our entrées, Chase and I were both in a seafood mood (surprise), so he decided on the Maine Lobster in Paradise, which was Cafe Thirty-A’s version of lobster mac & cheese, and I went with the seasonal grilled cobia. Again, the entree presentations were stunning! 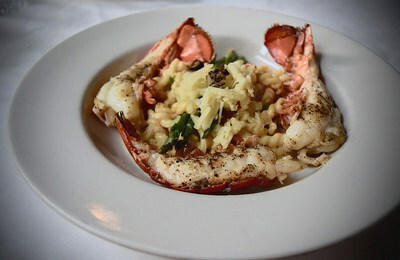 For those who enjoy a hearty mac & cheese, Cafe Thirty-A features a truffled blend of three cheeses that makes the tender, buttery lobster shine. The plump crawfish, asparagus, and sweet peas also added to the texture and flavor of the dish. I am not the world’s biggest mac & cheese fan, but I would definitely order this dish again, and would highly recommend that others do as well. Though the cobia was a lighter dish than the mac & cheese, it was not any less flavor packed. The generously sized, perfectly seasoned piece of fish was drizzled in a red-wine reduction sauce and accompanied by creamy polenta and tender green bean,s as well as a basil citrus tomato salad that added an extra kick to each bite taken. I absolutely love cobia caught in our local waters, and my taste buds were definitely satisfied. Though we were both stuffed from our incredible entrées, (admittedly, I ended up taking a doggie bag home) we still followed our previous review footsteps and ordered two desserts, as I have a tendency to not share sweets. Cafe Thirty-A prints a daily dessert menu so they can offer the freshest available. I decided on the triple berry cobbler (without hesitation), and I was not disappointed. The berry cobbler consisted of blackberries, blueberries, and raspberries that were topped with house made amaretto ice cream. The sweet ice cream contrasted well with the tart berries and the crunch of the pecans. Chase’s eyes immediately went to the bread pudding. Relentlessly, once again, the presentation of the dish was stunning, and the succulent bread pudding was dense with hints of cinnamon and was drizzled with caramel on top. Hearty, warm and comforting. Overall, our experience with Cafe Thirty-A was one of the best we’ve had in the region. Our wonderful waiter, who also happened to be named Chase, provided us with extremely quick and attentive service. I highly recommend this restaurant to individuals who are longing for delicious food along with a wonderful dining experience. From 5-6 PM daily, Cafe Thirty-A offers BOGO entrees of equal or lesser value. They also boast one of the best wine lists in the area. Cafe Thirty-A does recommend making reservations as it stays busy, especially in the summer. 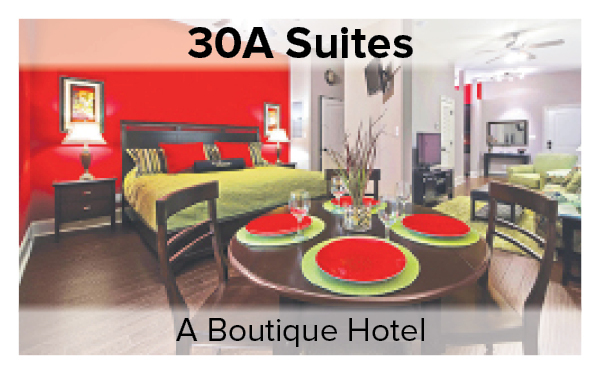 To make a reservation, please call (850) 231-2166.